Across northwest Zambia stretch thousands of square miles of miombo forest full of nectar-producing trees in rich diversity, buzzing with bees and inhabited by people who for generations have been experts in beekeeping. As a young beekeeper back in 1983, this was an amazing place to arrive in. I have assembled photos here to make a story showing how the beekeepers harvest their honey from the hives, without protective clothing, relying on their skill to avoid bee stings. Their beekeeping methods are similar to the European skep beekeepers of 150 years ago who harvested all the combs from their hives every year or two. This stopped bee diseases building up, something we are only just learning in the West today. 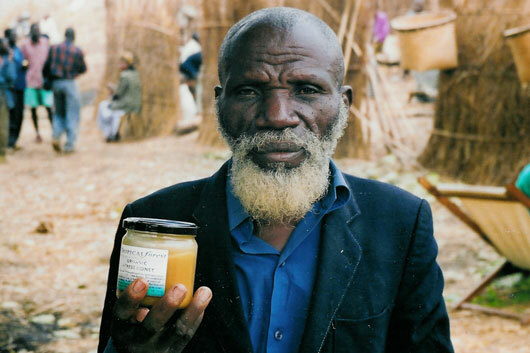 Tropical Forest Products has been buying Zambian honey and beeswax since 1990, allowing hundreds of families to earn a good income from beekeeping. Over the years production has increased and more containers of honey are exported, but the forest and the beekeeping methods remain the same.